Queens moved quickly to replace Peter Weatherson when they signed Alex Burke this afternoon, said manager John Connolly, "I reckon Alex is a great signing and I'm looking forward to working with him, we have been searching for a natural goalscorer for some time now and I think he comes into that category. Alex has loads of experience having played for Kilmarnock in the Premier League for five years, but he is only twenty-five and personally I think he should still be playing in the top league. 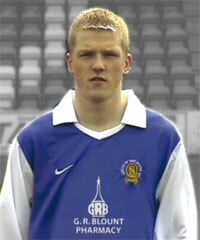 After Kilmarnock he had a brief spell with Falkirk then moved on to Clydebank and Berwick. At Clydebank he netted fifteen goals in thirty-two games and at Berwick scored fifteen in forty games, that's thirty goals in the past two seasons which is an excellent strike rate and that's what we're hoping he can do at Palmerston." Alex has signed a one year contract. No fee was involved. It was announced from Palmerston today that striker Peter Weatherson is to sign for Morton, said manager John Connolly, "I spoke to Peter when the offer first came in and assured him that although it was acceptable to the club, if he himself decided to decline it, we would be delighted for him to stay on at Queen of the South. From the clubs point of view losing a player of Peter's calibre is disappointing but we must also look to the future and consider that a year along the line he could leave Queens for free, we are no different from four or five other clubs in our division who have lost players in a similar fashion, just look at Inverness Caley Thistle with Wyness and Robson and St.Johnstone with Hartley, Murray and Lovenkrands, alas it's the nature of the game today. The reality is that if a player wishes to go then it's pointless to fight it for we would be left with a very unhappy individual. We made a promise to all our players that if a suitable offer ever came along we would let them know and the final decision would be left to them. We notified Peter and after consideration he decided to make the move to Cappielow. Although they are in a lower division Morton are currently a full-time club and this was the main attraction to Peter, for he has always wanted to be a full-time player and I can't blame him for that." We are up to November in Ewan Lithgow's review of the season and tonight Ewan looks at the draw with Falkirk that opened the month, the historic defeat of Ayr United in Ayr, the first ever AGM where we had two national trophies on show, an eight goal thriller in Inverness, the thumping of St.Mirren at Palmerston and the defeat of Arbroath at Gayfield, a pretty memorable month really. Click on the picture link on the right hand column. With the opening time for the club shop of 2.00pm you might have expected a queue to have formed a few minutes before opening time. However when John Paterson arrived at 1.30pm today a substantial queue of Queens fans had already congregated. The result was that some sizes were getting close to selling out by 2.00pm. Another terrific response by the fans in response to a superb effort by the club to address the criticisms of last year when Fila failed to deliver strips until well into the season. Well done to everyone and of course to Nike for doing what they said they would. Queens will make the same trip that they made on the last day of last season on the first day of this coming season as they face St.Johnstone at Perth for the season opener on 9th August. This will be followed by a home game against Ross County on the 16th August then either Motherwell or Falkirk away on the 23rd. The month of August finishes with an away match at Ayr on the 30th, which is a fixture that is repeated on the 3rd January. Our season concludes on the 15th May with the visit of either Motherwell or Falkirk to Palmerston. In other news the friendly arranged against Dalbeattie has been cancelled and Queens are now expected to play a training match between the first team and Under 18 side in its place. The match against Dumbarton has been confirmed as a 1.00pm kick-off. Full fixture list update tomorrow evening. The new Queen of the South home strip will be available from Saturday afternoon at the Club Shop at Palmerston. Some excellent behind the scenes work by the backroom staff has ensured that this seasons replica tops will be on sale earlier than ever before and means that you can be wearing yours on holiday this year. John Paterson tells us that he will be opening the shop between 2.00pm and 4.00pm, there will be a selection of sizes of the home strip and the pricing is held at last seasons levels of �35 for childrens and �40 for adults. The tops should also be available through all of the normal outlets next week. Congratulations to Queens fan Allan Hurley who was successful with his bid of �250 for the Mitie sponsored Queen of the South shirt as worn in the Robert Duvall film 'A Shot at Glory. The shirt was put up for auction by the Globe Inn (Howff) Doonhamers who were gifted it whilst at the Sanquhar Queen of the South Supporters Club Player of the Year awards. The Globe Inn (Howff) supporters will make a donation to the Sanquhar Queens Supporters of the �250 raised from the sale. Queens have arranged their last friendly of the season with a visit from Darlington on the 23rd July 2003 being confirmed today. The sides last met two pre-seasons ago when the side from the North East snatched a draw in the last minute following an early Warren Hawke strike for Queens. The auction for the Mitie shirt is almost at an end with your last chance to bid fast approaching. At 9.00pm tomorrow night the highest bid received will be accepted as the winner of the auction, we will announce the inner shortly afterwards. Remember that all of the proceeds will be going to the newly formed Sanquhar Queen of the South Supporters Club. Ewan reviews the month of October this week, a month that included our first national knockout tournament victory in the shape of the Bell's Cup. Click on the picture link to the right to read the review. At a board meeting held earlier this week Queens' Chairman, Ronnie Bradford announced his resignation from the Board on health grounds. While very disappointed about having to make this decision, Mr Bradford expressed his satisfaction and pleasure at the progress Queens have made during the 8 years he has been on the Board. He has served as Chairman for the last 4 years. Mr Bradford expressed the hope that the Board would soon appoint a successor and continue the good work at the Club. On behalf of the Board, Tommy Harkness expressed his sadness at the news but thanked Ronnie Bradford for his extraordinary effort on behalf of and generosity towards the Club. He pointed out the unprecedented success Queens have enjoyed under Ronnie Bradford's Chairmanship. Queens will meet a Newcastle eleven at Palmerston on Saturday 12th July in another pre-season friendly, kick-off 2.00pm. Tommy Craig okayed the match last night and it is expected that the Tyneside club will field a strong side consisting of fringe players, young players and first team men lacking in match practice as they did two years ago. Queens are also in talks with an English Second Division side regarding a fixture on Wednesday 23rd July. Make sure to check out Part 4 of the review of season 2002/04 by Ewan Lithgow, our resident away day reporter, tonight Ewan looks at the month of September, a month that saw bad luck on the pitch but excitement grow with the start of sales of the Challenge Cup Final tickets. Click on the photo link on the right hand side. Queens have arranged a game against local opposition for the evening of 9th July. The side will travel to Dalbeattie to face the locals at the Islecroft Stadium with a 7.45pm kick-off. Queens are presently in discussions with other clubs regarding filling the 12th and 23rd July slots with friendly matches. �10.00 to the first Queens fan to send in his/her holiday snap ("QOS on Tour") wearing the new Queens Nike shirt to the Official web-site or to our programme printers:- Solway Offset, Catherinefield Ind. Estate, Heathhall, Dumfries DG1 3PQ. P.S. - Shirts should be on sale later this month - watch web site/newspapers for info. P.P.S. - Any fan wanting to contribute article for programme contact Bruce at printers above. A very rare Queens top was gifted to the Globe Inn (Howff) Queens supporters club on Saturday evening whilst a number of their members were enjoying the hospitality of the Sanquhar Queen of the South Supporters Club at their annual awards night. The shirt was a number 16 used in the making of the Robert Duvall film "A Shot At Glory" and was one of only a very limited number that were produced with the sponsors name Mitie on the front. The Globe Inn (Howff) Doonhamers supporters have decided to auction this shirt with the proceeds going to the funds of the Sanquhar Supporters Club. Check back tomoorw night to see how to bid for the shirt, remember it will appeal to collectors of both movie and football memorabilia so we don't expect it to go cheaply. 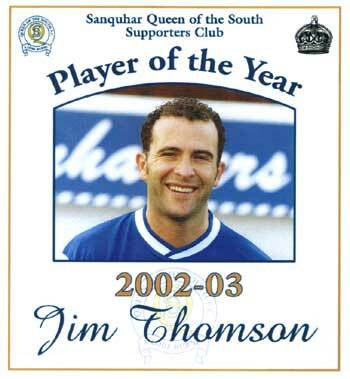 Jim Thomson was presented with the Player of the Year award at a function held by the Sanquhar Queen of the South Supporters Club on Saturday evening. The attendance was boosted by eight members from the Globe Inn (Howff) Supporters Club who made the trip to join the locals. Jim was presented with his trophy by Queens legend Jim Kerr who made 398 appearances for the side between 1960 and 1971. If you are looking for a match day sponsors package for next season then you will have to hurry as the number of available matches is reducing fast, contact either Margaret or Ian Heuchan on 01556 504569 to book your game. It has been announced that a local company based at the Crichton, Chef Fresh, will be in charge of all official corporate hospitality at Palmerston next season and will be working in conjunction with our commercial management team of Margaret and Ian Heuchan. The company already manage both lounge bars at Palmerston, said proprietor Craig Watson, "As a true lover of the game I am thrilled to have been given the opportunity to have my company associated with Queen of the SOuth Football Club. Based on last seasons results on the pitch we feel it is time to offer a corporate package of the same standard to allow guests the opportunity to enjoy some relaxed networking whilst also experiencing first hand the unique match day atmosphere. Our facility offers the combination of the magical club history with modern high standard entertaining and this year we are offering a wider range of packages which means we can tailor the package to meet requirements and budget everytime." Bookings can be arranged by contacting Operations Manager, Angela McIntyre (Telephone 01387 702170). Apologies for the typographical mistake in yesterday's quote from John Connolly regarding the withdrawal of the side from the Annan Tournament, the error did make a big difference to the context of the quote and should have been 'could' rather than 'would' when John was talking about the possibility of facing Stranraer in the Annan Tournament. Commenting on the Challenge Cup draw which saw Queens paired with Stranraer, manager John Connolly said, "It's a local derby, it's away from home and as cup holders everyone will be out to beat us. Also Stranraer have a new manager so it all adds up to a really tough tie, however we'll be going to Stair Park confident that we can overcome this first hurdle and progress further in the competition. However with us being drawn against Stranraer in the Challenge Cup we have now decided to withdraw from the Annan Tournament, it could mean playing them twice within the space of three weeks which I don't think would be a good thing. We'll now be looking to fix up another pre-season friendly match for that weekend." Queens will commence the defence of the Bell's Cup with a local derby match against Stranraer at Stair Park. The tie will be played on Saturday August 2nd - the first game of the new season. We're pleased to report that stopper Jim Thomson and 'keeper Colin Scott who underwent surgery for knee injuries earlier this week are recovering well. Both had been nursing their injuries during the latter part of the season but Jim Thomson had keyhole surgery to repair a torn cartilage while Colin had a cyst removed from behind his knee. Local printers Solway Offset won the match day mascot prize at this seasons Shirt Sponsorship Draw, however co-proprietor Malcolm Creedon categorically denied that Bruce Wright (Programme editor) will be their mascot for the day since the wee man flatly refuses to hold skipper Jim Thomson's hand when they run onto the park. There was an excellent turnout for the seventh shirt sponsorship draw which was held in the lounge bar at Palmerston tonight and the club were again very happy with the response from the public and local business community with 135 names going into the drum. The draw was made by Ian Scott the club's assistant manager, and his wife Lisa and afterwards club captain Jim Thomson presented Mrs Scott with a bouquet. Speaking on behalf of the winners Mark Blount said, "You could say it was something of a seven year itch with us as we've been itching to win this for the past seven times. We've never won anything in the past so to take the top prize is just great. All our family are ardent Queen of the South supporters and we have close ties with the club and have provided them with medical supplies for several years. I had a feeling that this time around we'd get lucky so I'm naturally delighted. We haven't decided what to put on the shirt yet but I'm sure we'll come up with something special. Mark's father Norman was delighted when their name came out of the drum, "I'm just delighted for all of the family", said the ex-chairman, "It's been a while coming but well worth waiting for." Speaking on behalf of Positive Response Communications (Last season's winners), the proprietors, Pat and Ian Hobson said it had been one of their best financial investments they'd ever made and wished the club every success for the future.